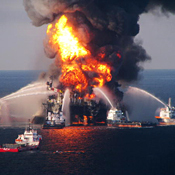 The reasons why Big Oil has moved offshore attract a wide range of explanations. We can take all kinds of real causes and fanciful factors for this long-term trend, with output growing at rates estimated by the IEA and other sources at up to 15% a year since year 2000. This growth has offset stagnation or decline of global onshore production. The causes can include environment activists adding legislative pressures for onshore operations, OPEC states limiting access to reserves or setting high "resource rent" revenue shares, greater security offshore for companies operating in African countries facing rebellion - but lower costs never figure in the list. Offshore oil is high cost oil. To be sure, we can quickly sum the move offshore as another example of global "oil addiction" working its strange magic, but this addiction faces geological limits, and strong energy economic factors shifting the energy mix away from oil as its price rises faster and higher than other fossil energy supplies. Likely the single biggest reason for Big Oil moving offshore is simple geology: despite the costs, the high tech and its risks, and extreme environment conditions, global oil reserves available in deep water remain attractive. Only at times of national environmental catastrophe like the present for the USA will we hear the basic reason for these risks being taken every day: oil is still too cheap. Oil is expensive relative to coal and natural gas, which in the US due to onshore fracture and shale gas is now at extreme low price. Oil is also expensive relative to uranium, which languishes at about one-third its most recent peak price of 2007. Facing this competition, the oil major corporations and OPEC NOCs must take all risks and shortcuts to maintain oil supply, to prevent oil being priced out of the energy business. This only however applies to oil as an energy mineral - not a petrochemical base, where the price per unit weight or volume (for example barrel of 159 litres) can be 4 times the price of oil as an energy commodity. World oil demand for petrochemicals is likely below 7.5 Mbd although growing fast, compared with total oil demand at 86 Mbd and growing at maybe 1% a year in 2010 after a 3.5% a year fall in 2009. Shifting away from oil energy is a nice idea, for example to protect us from what Al Gore calls the "unimaginable calamity" of global warming and paying high prices to terror regimes, for example Putin's regime, for the oil we import. The favored target for non-oil and non-fossil energy development is non-hydro renewable energy, but here we get a taste of real world energy economics. IEA estimates for 2009 suggested global investment in renewables dropped by as much as 35% on a year earlier. In some cases however, Spain is a big example, this was offset by debt-financed government fiscal and subsidy packages, leaving a trail of future debt to hide present high renewable energy costs. Spain's direct subsidies to renewable energy ran at about 6 billion Euro in 2009, but indirect "off budget" subsidies that future governments will have to pay, may be running at 15 billion Euro a year. To be sure, while oil prices ran wild and free from 2004 in a one-way rise to an ultimate (or we should say most recent) peak in July 2008, investment in renewable energy assets also surged, recording year-on-year growth of at least 60%, perhaps 75% in 2006-2007. But world activity slumped in 2008, with the oil price, as sources of finance contracted. This was further impacted by low fossil-fuel prices from mid-year 2008, reducing the economic incentive for new and often high cost investment in renewable energy. Only from late 2009 has there been any shift away from decline, as oil prices rebounded but in an unsure and confidence sapping global macroeconomic context. The answer to this lies in high and stable oil and other fossil energy prices. Instead, we have the Faustian bargain of oil prices spiraling when the economy recovers, and collapsing when the economy slumps - dragging renewable energy investment with it. To be sure, to some diehards this is pure and rational market price setting, benefitting from advice and financial products supplied and sold by Goldman Sachs and other future oriented, environment conscious commodity index providers. OPEC can of course still be wheeled onstage as a handy bogeyman any time oil prices rise above a flexible and rising psychological ceiling, and Big Oil can take the flak when it destroys the environment closer to home, in its quest to max production anywhere it can. Breaking out of this no-win, to a global energy win-win that integrates all parties - producers, exporters, importers, consumers and users - may in fact be helped by this latest oil catastrophe. No energy producer can, or should live with prices that can shift from US$ 145 a barrel to US$ 38 a barrel in a few months, and similar price swings apply to coal, gas and uranium. Consumers and users also do not need wild price swings of basic need commodities, raw materials and services. To be sure, the trading community feeds off wild price swings, but this community has lost status and esteem in a serious way, since 2008. Surprise that world surplus and shut-in oil production capacity is almost always low, and often exaggerated is totally irrational given the price surges and swings, basic geology, and extreme incertitude on future energy policy in major consumer and importer countries. Stabilizing world oil will not be an overnight project - and will not come cheap. Shifting the global energy mix away from the fossil fuels will happen this century, even if global warming catastrophe may be late to the party, or never come at all. In this real world perspective for energy transition, intensified by concern over the latest environment catastrophe, oil price rises to above US$ 90 a barrel are a necessary stage - not a signal for panic.